Older style tower being reused for a few microwave dishes and other unknown antennas up top. Located on the corner of Bentpath Line and Brigden Road, just east of Mooretown, Ontario. Re-evaluating this site, I think this cell tower deserves 5 stars for ugliness. There is nothing soothing to the eye about it whatsoever. If I were a base jumper this might be tempting however 50 meter cell towers are not high enough for chutes to deploy properly. "Death from above" has a whole new meaning as working as a cell tower rigger is considered to be one of the deadliest jobs out there. 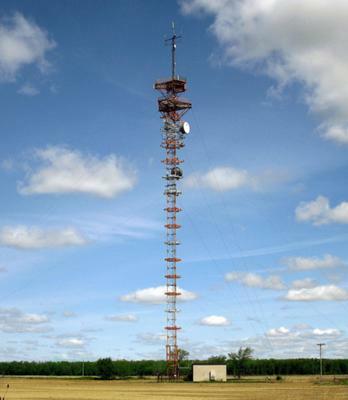 Every year several tower climbers fall to their deaths from cell towers. Looks top heavy. Cell tower for bungee jumping? It makes the view shed evenly balanced.